It's that time of year. Every mag is full of dreamy coastal retreats. You can't flip a glossy page without a visual assault by all manner of seaside design conceits. Starfish? Check. Resin coral or *gasp* the real thing? Check. Navy and white stripes? Check and check. Wicker? Check. Nickel hurricanes? Check. Blue Hydrangeas? Check. Of course, I'm a stylist and continue to use many of these tricks. But when is enough enough? 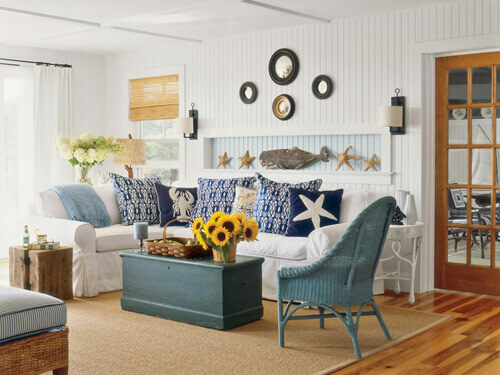 When does a room go from gorgeous coastal to cloying coastal? When is it too much of a good thing? Here are 2 examples. A dunes home on Long Island by Steven Gambrel.